Warhammer: Vermintide 2 is back with its four-player melee co-op gameplay. Fatshark has expanded the gameplay, with three new careers for each of game’s five heroes. Of course, the Skaven horde are tougher than ever, thanks to their new Chaos allies. Warhammer: Vermintide 2 is set shortly after the events of the first game. After breaking out from captivity, the five heroes of Ubersreik find themselves reunited as the Svaken look to open the Skittergate. The gate will allow the combined forces of the Chaos and the Skaven to overwhelm the border city of Helmgart. Storytelling in Warhammer: Vermintide 2 is understandably challenging because the game is a multiplayer title. The overall story serves as a good backdrop to all the Skaven killing, but it is not the main event by any means. It is possible to play the game in chronological sequence, but Fatshark incentivize players to utilize the Quick Play option with loot bonuses, making it difficult to enjoy the story in a coherent sequence. Warhammer: Vermintide 2 is a dialogue heavy. The four heroes are constantly speaking to each other in game. The dialogue serves as both entertainment and a subtle method of providing tips for the players. There’s plenty of dialogue to go around, though some of the really generic lines will be heard several times each round. The characters are generally likeable, for the exception of the wood elf Kerillian. Patronizing, mysterious, and a touch arrogant; she’s a character that players will love or love to hate. 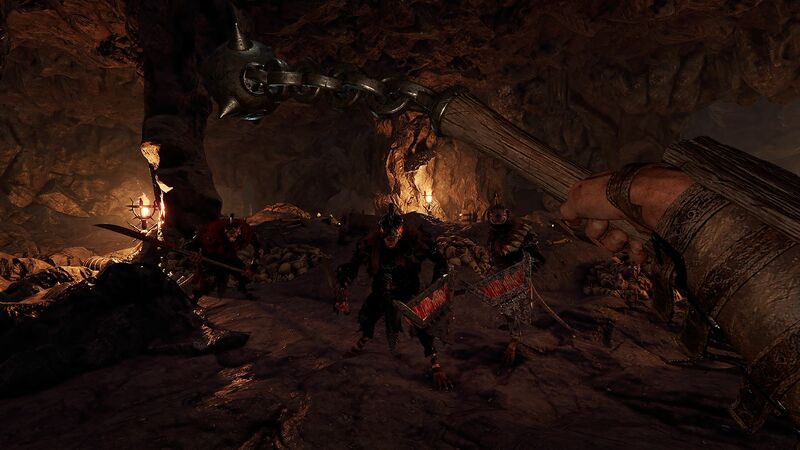 Warhammer: Vermintide 2 is a first-person game that combines bone crushing melee combat with a touch of FPS and RPG mechanics. The melee system is very simple to learn as the Recruit difficulty can be conquered with only the two basic attacks and the odd block. To survive the game’s higher difficulties, players will need to master the outer ranges of their weapons and the timing for dodging and parrying. For extra variety, the game offers a wide range of melee weapons, each with their own traits, attack range, and strike patterns. Augmenting the melee weapons are ranged weapons with extremely limited ammunition. Ranged weapons are designed to take down enemies with special abilities, bosses, or help give players a bit of breathing room in the face of a horde. While there are a few career paths that lean heavily on ranged weapons, all characters will fall back on melee combat at some point. The game offers five heroes, each with three different career paths that has its own talent tree and abilities. Each hero levels up independently and unlocks a talent option every five levels to a cap of 25. The new career path system is a fantastic addition to the series. 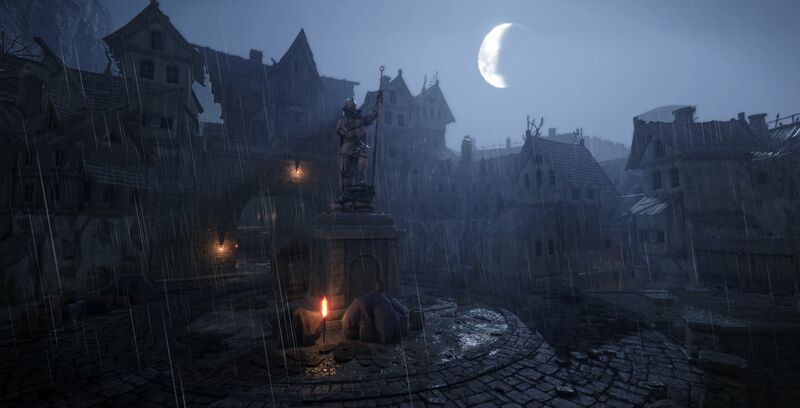 The first career path will be familiar to Warhammer: Vermintide players. The two new career paths provide a completely new playstyle without the hassle of leveling up a new character, as the paths often unlock a few new weapon types unavailable to other careers. Level design is excellent. The levels are linear in nature, but there are plenty of side areas and puzzles to discover for bonus loot. While the item and enemy spawns are random, the game has a good variety of set pieces to experience, ranging from epic boss battles and tense holdouts. Warhammer: Vermintide 2’s most addictive quality is its gameplay. The Left 4 Dead series proved that a co-op game with four players completely dependent on each other works. 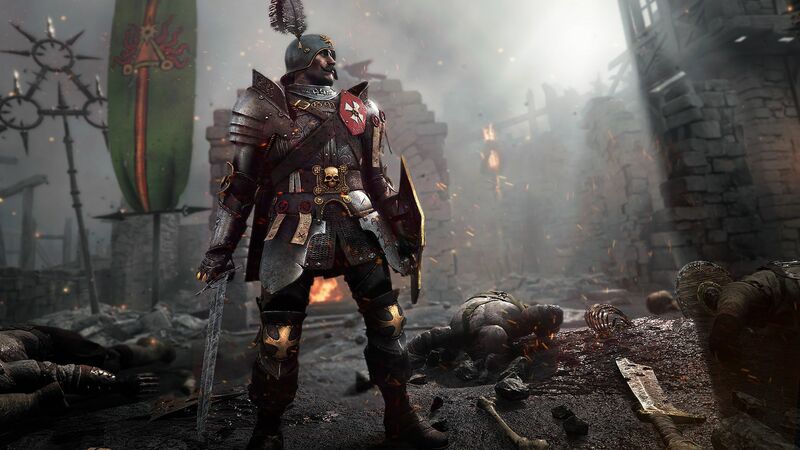 Vermintide 2’s builds on that winning formula by challenging players to figure out how to build a successful team, whether its on the fly at easier difficulties in Quick Match or with plenty of planning at later difficulties. Additionally, the melee gameplay creates a constant feeling of terror that can’t be matched with a range-focused game. The close quarter gives enemies a better chance of being able to hit a player, forcing players to rely on both accuracy and defensive skills. Melee combat also develops an incredible sense of tension and is even more punishing to characters who decide to wander off their own. Warhammer: Vermintide 2’s progression system gives the game a little extra replayability. The item treadmill works well, providing an incentive to play more and offering options for players to min/max their characters. The crafting system is rather basic, mostly focused on offering players a way to upgrade current weapons or turn unused gear into another chance at the item lottery for an item they will actually use. As loot boxes with gear only drops at the successful completion of a mission, players can take on randomly generated Heroic Deed missions that add devious modifiers to the game in exchange for an extra box or two of loot at the end. My only criticism is that the stats system is a bit vague. Since there is no easy way to see your own base stats, the exact effect items have on a character tend to be unclear. Warhammer: Vermintide 2 offers easy to learn controls that will be familiar to anyone who has played an FPS. The controls are extremely responsive. The combat’s emphasis on timing and accuracy means the game only needs a small number of keybindings, keeping things nice and simple. Fatshark still needs to work on polishing Warhammer: Vermintide 2 to a mirror shine. The game’s balance is work in progress, as some career paths and weapon types are woefully underpowered. As of the 1.0.6 patch, there are still random bugs that pop up. I found most bugs were rather benign, ranging from odd graphical glitches to the same audio line being repeated four to five times in a row. More troublesome bugs pop up from time to time, such as bots getting stuck in an area or special enemies dragging players behind inaccessible doors. 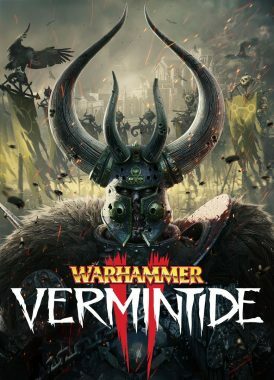 Warhammer: Vermintide 2 looks great. The game has a dark and gritty atmosphere that pairs well with the violent up close and personal melee mechanics. Fatshark’s artists does a great job with colour, relying heavily on earth tones then using splashes of crimson red and acid green to draw attention to important things. My only issue with the game is the lighting balance. Even with the gamma set correctly, the dark areas can be difficult to see, while the bright areas are almost blinding. The audio experience is excellent. 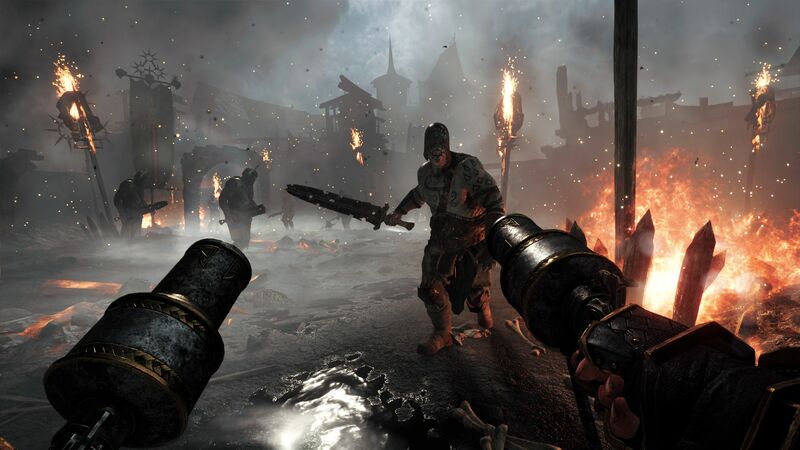 Warhammer: Vermintide 2 uses sound as part of the gameplay mechanics, using directional sound effects as warnings for nearby special enemies and to create anxiety and tension. Players unable to hear cues for whatever reason aren’t left out either, as the heroes will verbally warn each other of nearby special enemies, which will show up as part of the game’s subtitles. The voice acting is good, though it falls short of an AAA title performance due to its exaggerated acting. The soundtrack is does a great job of creating the right mood, from the creepy quiet moments to the frantic battles against a horde. Most will say that Warhammer Vermintide 2 fills the void for impatient gamers waiting for Left 4 Dead 3. But I think that sells Vermintide 2 a little short. 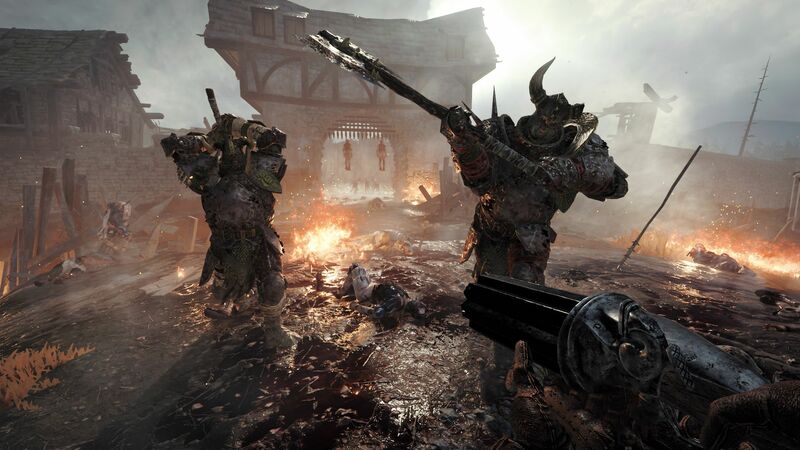 While the storytelling is a little disjointed and the game could use some polish, Warhammer: Vermintide 2 offers tense gameplay that rewards co-operation, player skill, and a touch of strategy. Its melee combat is simple to learn but offers a high skill ceiling that will challenge veteran gamers. Combined with its high replay value and affordable price, it’s easy to recommend Warhammer: Vermintide 2.